Forget all the bad and just give a gift to your friend in Minecraft PE by installing this addon. It includes the following things: christmas tree and socks, colorful gifts and delicacies, Santa Claus’s reindeer, festive garland, cheerful villagers and also the one without whom there can not do any Christmas – Santa. Before building a dream house anywhere in the winter biome, reduce the brightness, turn on the night and arrange more torches or other lighting. At such moments Minecraft PE becomes a place where you can get a lot of fun and remember what happened to you for the whole year. 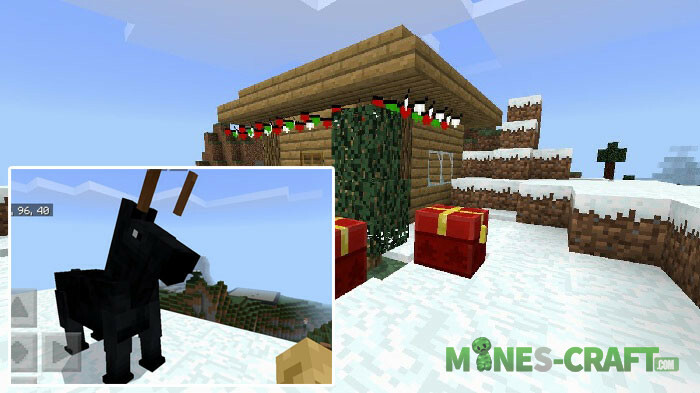 If you want to get the same thing in Minecraft Java, then go here – Christmas Decoration Mod.